Café Achshav returns to Temple Israel of Natick on Sunday, April 10, at 7:15 PM, with an evening of spirited Klezmer! This year, Café Achshav brings you the Strauss/Warshauer Duo – Deborah Strauss (violin, accordion, vocals, dance) and Cantor Jeff Warschauer (guitar, mandolin, vocals) – who have been at the forefront of the international Klezmer and Yiddish music scene for 25 years. Strauss and Warshauer were long-time members of the Klezmer Conservatory Band, one of the premier groups of the Klezmer revival; both have performed with legendary violinist Itzhak Perlman on film and in concert. As the Strauss/Warschauer Duo, they have performed to overwhelming acclaim at the Philadelphia Folk Festival, Great Britain’s Fiddles on Fire, the Jewish Culture Festival in Cracow, Poland, and the Art of Yiddish in Los Angeles with the late actor and singer Theodore Bikel. 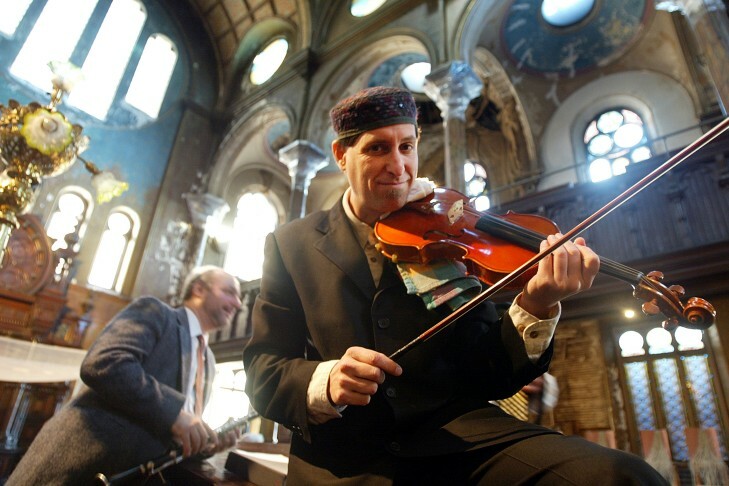 Jeff is the Cantor at Temple Sinai in Massapequa, NY and Founding Artistic Director and Senior Artistic Advisor of the KlezKanada Institute for Yiddish/Jewish Culture and the Arts. He is on the faculty of Columbia University in New York and is a graduate of the H.L. Miller Cantorial School at the Jewish Theological Seminary. Deborah is a highly regarded Yiddish dancer and dance leader. She has performed with the Grammy-winning Klezmatics and appears in the new film, Theodore Bikel: In the Shoes of Sholom Aleichem. She is also an award-winning children’s educator. Adult admission purchased in advance is $25.00 per person; $30.00 at the door. Admission for youth ages 5-17 is $15.00. Sponsorship opportunities are also available, and we are grateful for the support of all sponsors. Please contact the Temple Israel of Natick office at office@tiofnatick.org or 508 650 3521 to purchase admission or learn more about sponsorships. Plan ahead: purchase admission for a table of ten, and bring friends and family to Café Achshav! Experience the joy of Klezmer music while noshing on irresistible desserts and schmoozing with good friends and family. Who knows, maybe there will be ah bisl dancing? See you at Café Achshav, Sunday, April 10, 7:15-9:15 p.m.!